Whatever happens after the conventions, both candidates enjoy an enviable standing with voters as attractive figures instead of a pair of lesser evils. The fall capaign may alter this, but even after a hard fought primary season the nominees remain attractive figures. 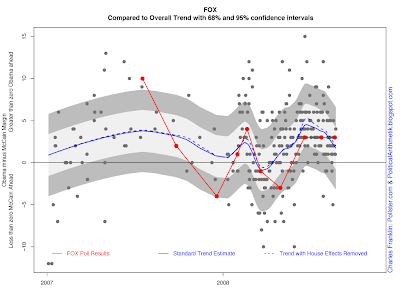 Meanwhile, Senator Clinton has also enjoyed an upturn in favorable ratings and a decline in unfavorable ratings since the end of the primary season. 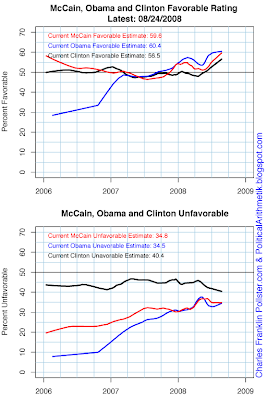 While improved, Clinton remains a more polarizing figure than either McCain or Obama, with slightly lower favorable but noticeably higher negative ratings. 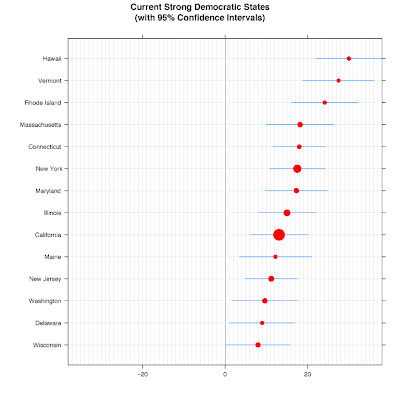 Senator Clinton is far more popular among Democrats than among either Independents or (especially) Republicans. In that sense, her speech to the Democratic Convention last night was an example of speaking primarily to the party and her supporters, rather than to the broader public. The contast between former Virginia governor and now Senate candidate Mark Warner's speech and Clinton's is a good example of this difference. Warner stressed unifying themes and appeals across political groups, which was greated warmly but which fell short of electrifying the Democratic delegates. In contrast, Clinton played to the party and produced a predictably enthusiastic response within the DNC convention hall. Conventions contain both elements. Monday, the party celebrated Sen. Kennedy's life and family legacy, primarily an inside the family affair, perhaps touching some independents but not likely to attract Republicans. In contrast Michelle Obama's speech could have easily been given at the Republican convention, with its themes of family, hard work, pulling oneself up from working class circumstances. Hers was a speech designed to reach out beyond the party. The one remaining question from the Clinton speech is whether her supporters also resepect her enough to follow her lead. For Clinton to be a power in the party includes the requirement that she be able to deliver her supporters for Obama. If any significant number of her supporters refuse to be delivered, they reduce her status as a result. This is hard to judge from the cable news coverage, who can easily find individual delegates willing to say they are unpersuaded. But what effect the Clinton speech has with her supporters outside the convention hall will be critical. It's all about who votes. Those that do win. Those that don't lose. The chronic losers in American politics are the young who famously turn out at low rates election after election. This year, those young people are of great interest. Allegedly they will be mobilized in huge numbers, and allegedly they will vote strongly for Barack Obama. The latest available Gallup weekly estimate (July 28-Aug 3) shows Obama leading 56%-35% among 18-29 year olds, while McCain leads 46%-37% among those 65 and older. But will the young vote? And how much difference does it make when they don't? 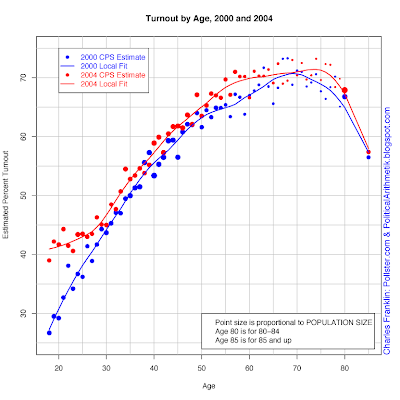 The chart above shows the turnout rate by age for 2000 and 2004, based on the Census Bureau's "Current Population Survey (CPS)", the largest and best source of detailed data on turnout. The most striking result is just how low turnout is among those under 30 compared to older voters. 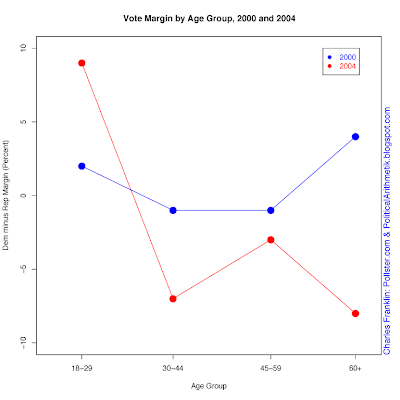 No age group 18-29 managed to reach 45% turnout in 2000, and only two made it in 2004. 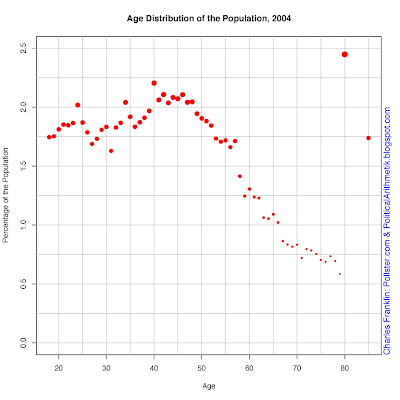 Not one single age group over 30 fell so low in either year. Despite a little noise for each group, the pattern is a strong rise in participation rates with every year of age at least until the late 60s, after which there is some decline. Yet even among those 85 and over the turnout rate remains above 55%, more then 10 points higher than among their 20-something grandchildren and great-grandchildren. The second striking feature of the chart is that the young can be mobilized a bit, under the right circumstances. 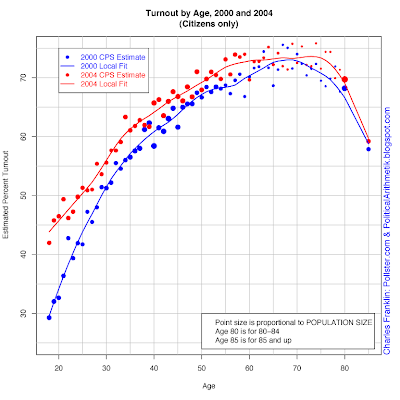 Turnout among those under 30 rose significantly in 2004 compared to 2000. While turnout went up among all age groups, the relative gain was clearly greater among those under 30. While mobilizing the young is difficult, these data show that it is possible to get significant gains, at least relative to past turnout. Even so, the "highly mobilized" 20-somethings of 2004 still fell behind the turnout of their 30-something older siblings. A supposed Obama-surge among the young may still not catch up with those even a bit older. The "boomers" in their 40s and 50s remain the largest group, but for our purposes there are two important points. Those under 30 make up a substantial share of the population, while those 60 and over represent a substantially smaller share at each age. High turnout buys "over-representation". Divide share of voters by share of the population and you get proportionate representation. A ratio of 1.0 means a group votes proportionate to its size. Values over 1 are overrepresented groups. 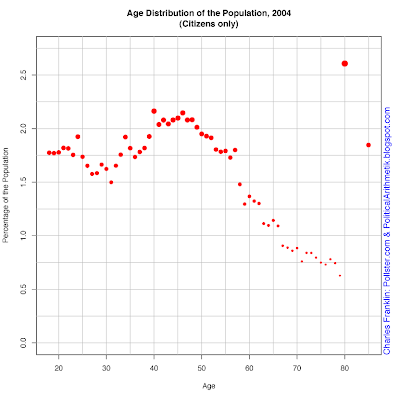 In 2004, for example, 55 year olds were represented 20% more than their population would suggest, with a 1.2 score. 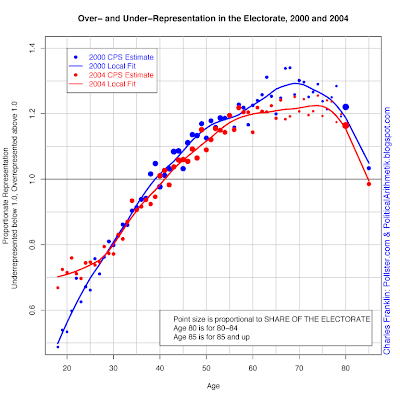 The youngest voters, 18 year olds, had an abysmal representation rate of 0.49 in 2000, less than half their share of the population. So what are the implications? If you gave me a choice of being wildly popular with the young or moderately popular with the old, I'd take the old any day. 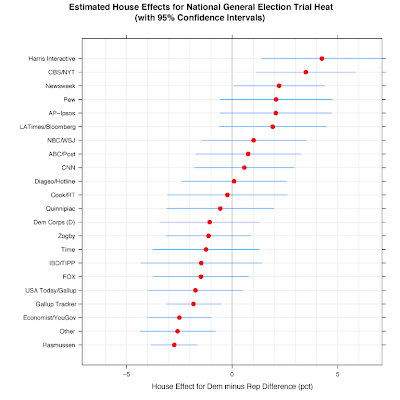 They are far more reliable in voting, and while their population numbers are small they more than make up for it in over-representation thanks to turnout differences. 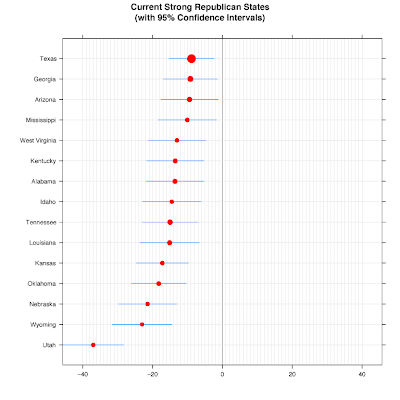 There is much conversation about "youth" turnout this year. Perhaps we will indeed see another rise, as we did in 2004. But unless something truly unprecedented occurs, no one can win on the young alone. 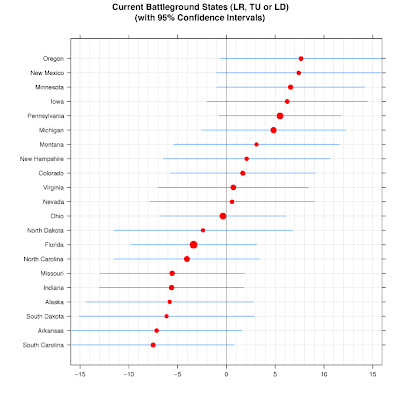 The gap in turnout is simply too large. But is age destiny? 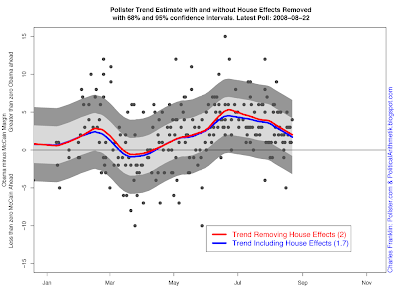 If there were constant differences in partisan preference by age, then perhaps so. But there aren't. 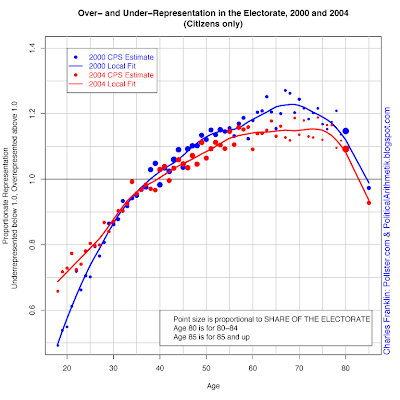 Despite being supposedly "old and set in their ways", those 60 and up shifted their votes more than any other age group between 2000 and 2004. In 2000, the 60+ vote went to Gore by a 4 point margin. In 2004, however, those 60+ went for Bush by 8 points. That net 12 point swing, multiplied by their over-representation means a lot. The 20-somethings also shifted, from +2 for Gore to +9 for Kerry. 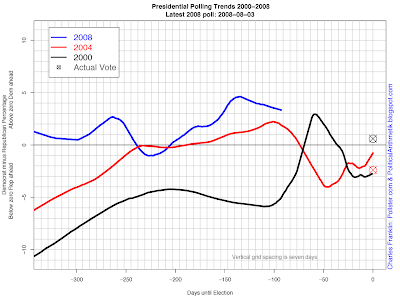 Coupled with their surge in turnout, the younger voters kept Kerry close in 2004 when he was losing in every other age category. But it wasn't enough to win. 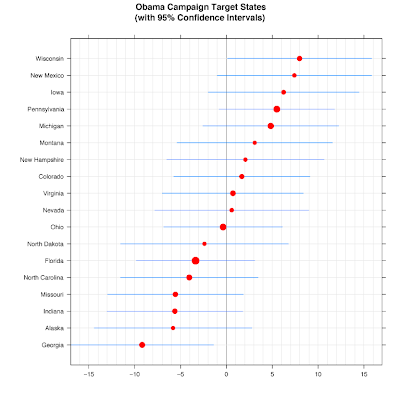 The Obama campaign may be right that they can gain votes by mobilizing the young. But the old play a bigger role in elections, and they are not imovable in their vote preferences. Indeed, they make the youngest group seem a bit static by comparison. It is not the candidate's age that will be the key to winning the votes of those 60 and over. Issues and personality will play a large role. Any candidate would be well advised to recognize that the dynamic swings among older voters coupled with their substantial over-representation makes them a potent force for electoral change. P.S. 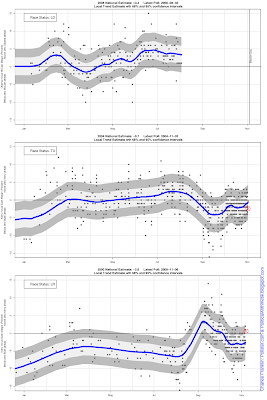 At the cross post to Pollster.com, Michael McDonald noticed that my plots were based on population percentages rather than percentage of citizens. That's a good catch and I probably should have used citizens in the first place. But the qualitative results don't change at all, so my story remains exactly as it is above. The precise percentages quoted do shift a little bit, but not in ways that change any of the conclusions. Therefore I've left the text above as it was, but append the first three figures, revised to include only citizens, here for completeness. Thanks to Michael for pointing this out.